Major General Ahmed Abdallah, the governor of the Red Sea, decided Sunday to suspend a tourist boat from operation for a week, and fined its owner LE5,000 for causing damage to coral reefs in the Dair coral reef area, in response to a report published by Al-Masry Al-Youm on Wednesday. 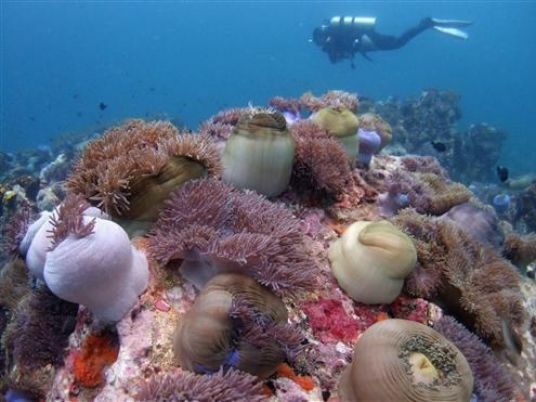 A number of marine ecologists and dive centers warned of several coral reefs being destroyed as a result of boats directly connecting iron wire from its anchors to live coral reefs, Al-Masry Al-Youm published photographic proof in the story. Director General of the Red Sea Protected Areas Ahmed Ghallab, submitted a request to the governor to suspend the boat which committed violations. Marine environment experts and diving centers warned of the disappearance of coral reefs in the Red Sea due to launch boats, used for diving trips and maritime activities, tying their iron anchors into live coral reefs, especially in the area between al-Gouna and Hurghada where buoys are not available. Hassan al-Tayeb, chairman of Rescue and Environmental Protection Society (REPS) in Hurghada, said tourists and divers sent several complaints to REPS about the unavailability of buoys in several sites where the coral reefs have disappeared. Tayeb said that he sent requests to the Ministry of Environment to increase the number of buoys in the seas to preserve the coral reefs, which attract thousands of diving enthusiasts every year. Ministry of Environment and the Red Sea dedicated LE1.5 million to buy materials for buoys, which is to be installed by a civil association in Hurghada.